It is a lot of recipes. 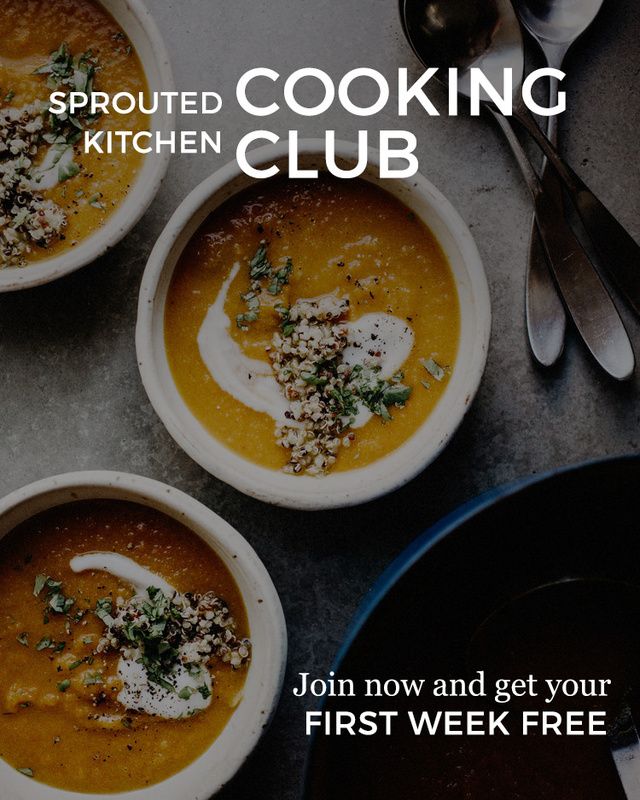 It sounded manageable in theory; write four recipes each week for Sprouted Kitchen Cooking Club, keep up loosely here on the blog, my private chef job, occasional freelance work, try to keep up with instagram content anddddd my little family with two spirited wee people. It’s a lot of time in the kitchen, let’s just say that. I don’t idolize busyness, I try not to use that as a response to “how are you?” because it’s overused and self imposed. Being busy is not a state that makes me respect someone any more nor a flurry in which I wish to reside. I try to honor that, as I schedule activities and social plans for our family, but with two parents who have their own businesses which seem to keep birthing more mini side businesses, “busy” feels like a word I have to try really hard not to use. I was thinking about how there are likely a number of you who feel the same, perhaps with kids or a demanding job and the hamster wheel feels exhausting. I wanted to share a recent SKCC favorite - this vegetable tagine. It’s a bit of chopping up front, but it simmers away in a just-spicy-enough broth and you ladle it over couscous which sort of blends in and thickens the whole thing if/when you stir it around. The garnishes are important, a little creaminess and crunch. The best part is, that it gets better on day two or three, when the vegetables really soak in the flavor from the broth so leftovers are welcome. Big pots of soup and stews seem to calm me. They speak of comfort and warmth and leftovers that get you out of making yet another meal. Maybe you’re overwhelmed or lonely or worried or sad or doing super great this week but I just find this stew to be a recipe for all people of any sort of circumstance. Food is special - it connects and heals and nourishes and slow us down in a good way (hopefully), so I hope you take good care of yourself this week! xo. They sell harissa paste at Trader Joes, Whole Foods and larger grocers near the salsas or international foods section. While it will vary by brand, it is spicy, so if you are timid with that, start with one teaspoon and add from there. We use the TJ’s version and while 2 tsp. is definitely warm, it's not burn your face off warm. In a large dutch oven over medium heat, warm the butter or ghee. Prepare all your vegetables and preheat the oven to 300’. Add the potato, onion, garlic, cauliflower and salt and sauté about 5-7 minutes until there are some brown marks on the edges and they just begin to soften. Stir in the bell pepper, zucchini, cumin, coriander, harissa, honey and tomatoes and all their juices. Stir and cook another minute. Add the can of chickpeas and broth and bring it to a gentle simmer. Cover the pot and transfer it to the middle rack of the oven. Bake for 35-40 minutes until vegetables are tender. Let it cool a bit on the stove and then taste for seasonings. While the vegetables cook, prepare your couscous. Bring 1 cup of water, a pinch of salt and the butter to a simmer. Add the couscous, stir, turn off the heat and let it sit for 5 minutes to hydrate. The same can be done in a microwave, instructions are typically on the back of the box. Stir in the apricots and set aside. To serve, put a scoop of couscous in the bowl with a few ladles of the vegetable stew on top. Garnish generously with plain yogurt, lots of cilantro and some toasted nuts. 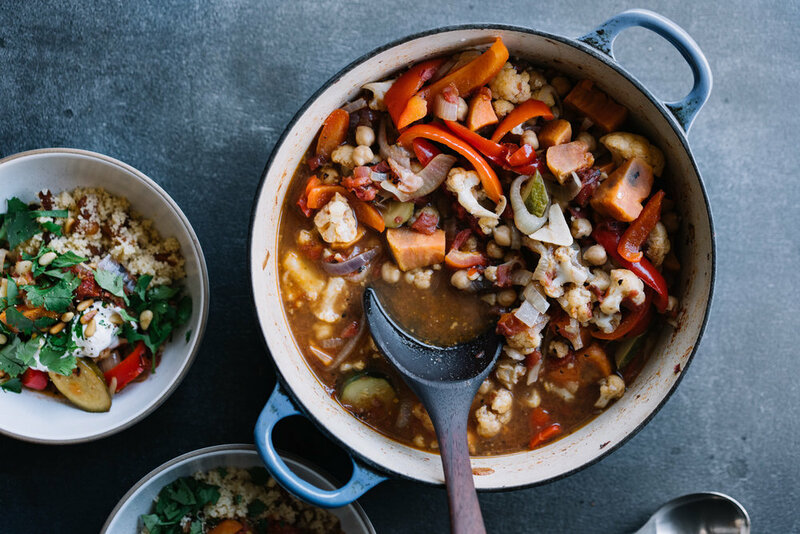 A hearty, spiced vegetarian stew. In a large dutch oven over medium heat, warm the butter or ghee. Prepare all your vegetables and preheat the oven to 300’. Add the potato, onion, garlic, cauliflower and salt and sauté about 5-7 minutes until there are some brown marks on the edges and they just begin to soften. Stir in the zucchini, cumin, coriander, harissa, honey and tomatoes and all their juices. Stir and cook another minute. Add the can of chickpeas and broth and bring it to a gentle simmer. Cover the pot and transfer it to the middle rack of the oven. Bake for 35-40 minutes until vegetables are tender. Let it cool a bit on the stove and then taste for seasonings.